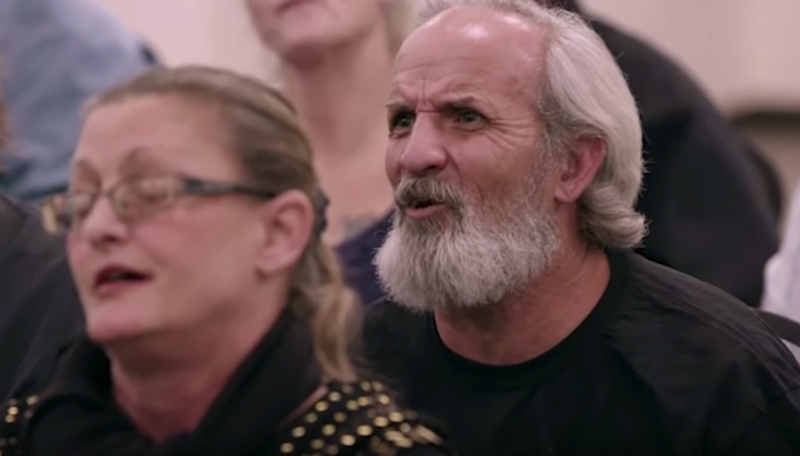 Sacha Baron Cohen’s Who Is America is currently tearing apart the political scene in America. Well… maybe tearing apart is a bit excessive, but it’s definitely kicking up a storm. In case you haven’t seen it, the show revolves around Cohen taking up numerous different disguises – ranging from a militant Mossad agent, to a far right conspiracy theorist, an ex-con artist, to an Italian billionaire – and conning American politicians, as well as the public, into either uproar, or saying utterly abhorrent films. This. This right here. Is potentially my favourite few minutes of the TV show so far. Welcome Dr. Nira Cain-N’Degeocello to the stage. Nira is an ultra left wing lecturer on gender studies, who seeks to do nothing more than ‘heal the divide’ in America. Stick Dr. Nira in Kingman, Arizona, give him (or whatever their preferred pronoun would be) a microphone, and it isn’t long before people start to get pretty p*ssed off. But just what is it Nira is talking about? The segment of the show begins with Cohen asking: ‘Who wants to see huge economic growth here?’ A cheer erupts and hands begin to clap. ‘Who wants to see an investment of $385 million dollars?’ More cheer and hand clapping. ‘Well you guys are going to get it!’. I’m here to tell you that Kingman has been chosen as the location for a brand new, state of the art, Mosque. Arms fold. Sighs of anger are excreted via the mouth. I know some of you are thinking that this is just another typical Mosque. 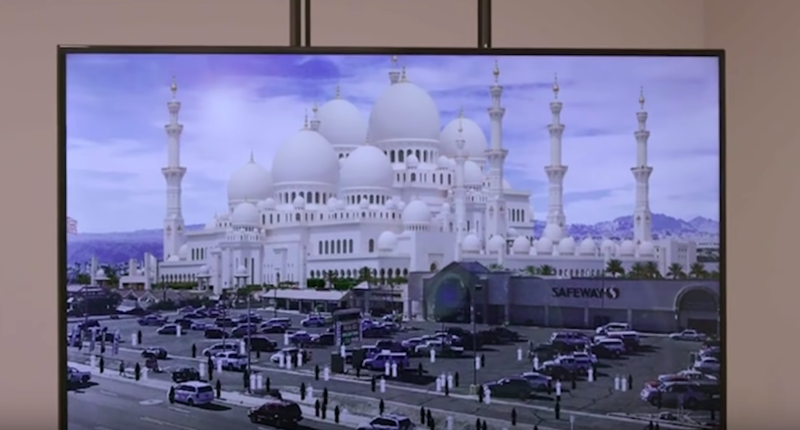 This guys… is going to be… the world’s largest Mosque outside of the Middle East. Eyes full of hatred stare up at Cohen as he stands on the stage. Almost every person in the room has their arms folded in bitterness. ‘Your town is going to become a hub of tourism for Muslims across the world. Can I get a whoop whoop?’. There’s a helluva lot of no’s which get shouted back in Cohen’s direction. Every city has resident voices that challenge respect and dignity for others. They are wrong and unfortunate. 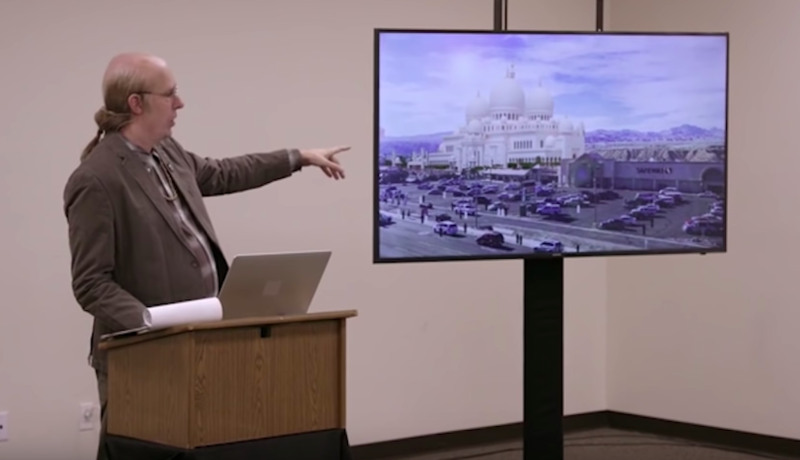 That was no exception on Sunday’s ‘Who Is America?’ show on Showtime in which an actor baited purported residents to vociferously oppose a fictitious, super sized mosque in our city. Why? Because our community has made great strides to erase previous perceptions. We do have a mosque. We do have a robust Latino community. We do welcome tourists from all over the world, especially more and more from Asia fascinated by our Route 66 history. We do have African-Americans applying for leadership positions with the city. This is the Kingman of today, not of yesterday. Shrugging this off is not going to be us. 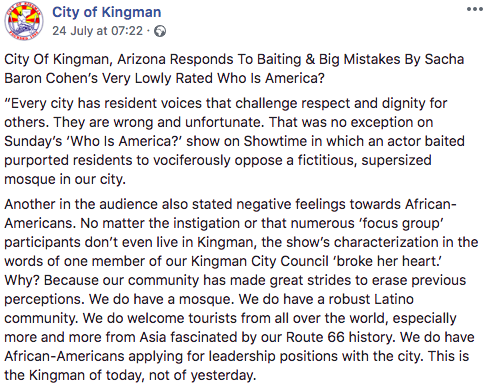 We’re going to use this opportunity to keep moving our community forward with the help of many community stakeholders, including the Kingman Interfaith Council.